The key element for a great tablet has always been a truly innovative and top performing display, and the best leading edge tablets have always flaunted their beautiful high-tech displays. 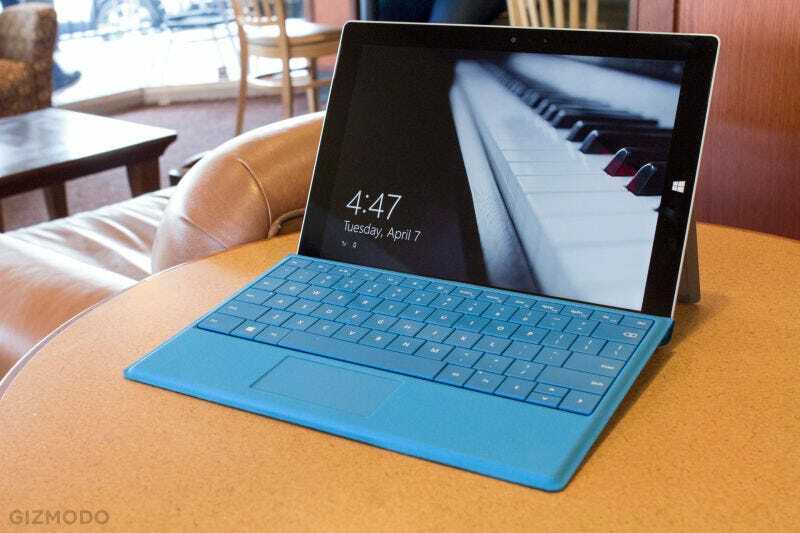 The Microsoft Surface 3 is no exception. The Surface 3 tablet is a smaller and lighter version of Microsoft’s flagship Surface Pro 3, with a 10.8 inch screen instead of 12.0 inches for the Pro. What is particularly interesting about the Surface 3 is that its display performance is almost identical to the excellent Surface Pro 3 display, including a full sRGB Color Gamut. But in addition, it has a bonus: The Surface 3 is the first display that has a Color Gamut optimized for typical 300 lux indoor ambient light levels instead of for the dark, like all other current displays. It provides the best absolute color accuracy on a display for real-world indoor ambient lighting levels of 300 lux, an important performance feature that no other display currently provides. Based on our extensive lab tests and measurements, the Surface 3 has one of the very best and most accurate displays available on any mobile platform and OS. It joins near the top of a small set of tablets that have excellent top tier displays. We’ll cover these issues and much more, with in-depth comprehensive display tests, measurements and analysis that you will find nowhere else. To examine the performance of the Microsoft Surface 3 Display we ran our in-depth series of Mobile Display Technology Shoot-Out Lab tests and measurements in order to determine how it performs compared to other leading tablets. We take display quality very seriously and provide in-depth objective analysis based on detailed laboratory tests and measurements and extensive viewing tests with both test patterns, test images and test photos. To see how far LCD and OLED mobile displays have progressed in just four years see our 2010 Smartphone Display Shoot-Out, and for a real history lesson see our original 2006 Smartphone Display Shoot-Out. In this Results section we provide Highlights of the comprehensive DisplayMate Lab tests and measurements and extensive visual comparisons using test photos, test images, and test patterns that are covered in the advanced sections. The Display Shoot-Out Comparison Table summarizes the Lab measurements in the following categories: Screen Reflections, Brightness and Contrast, Colors and Intensities, Viewing Angles, LCD Spectra, Display Power. You can also skip these Highlights and go directly to the Conclusions. In terms of display size based on screen area, the Surface 3 is 19 percent smaller than the Surface Pro 3 screen, but 19 percent larger than the iPad Air 2 screen. The screen’s 3:2 (1.50) Aspect Ratio is an excellent compromise between the 4:3 (1.33) Aspect Ratio for most documents (the same as 8.5x11 inch paper with 0.5 inch borders, and also the iPad’s 4:3 Aspect Ratio) and 16:9 (1.78) Aspect Ratio for widescreen video content (and similar to Android tablets that have a 16:10 (1.60) Aspect Ratio). The display’s 1920x1280 pixel resolution has 2.5 Mega Pixels, which is 19 percent more than on 1920x1080 tablets or HDTVs, but 21 percent less than the Surface Pro 3’s 3.1 Mega Pixels. The screen’s 214 pixels per inch (ppi) is Very Good, but somewhat lower than on other full size tablets, like the Apple iPad Air 2 with 264 ppi. But at typical viewing distances of 16 inches or more the pixels are not resolved with normal 20/20 Vision, so the display appears perfectly sharp. In addition, the Surface 3 uses Sub-Pixel Rendering (called ClearType in Microsoft’s implementation) that significantly improves the visual sharpness of text and graphics over standard Pixel Rendering that is used in most mobile displays. For black and white and gray images with sub-pixel rendering, there is up to a factor of 3 improvement in image sharpness, so the Surface 3 actually delivers sharper text and graphics than almost all other tablets. Color Accuracy is especially important for many imaging applications when you must be sure of the on-screen image colors, when viewing photos from family and friends (because you often know exactly what they actually should look like), for some TV shows, movies, and sporting events with image content and colors that you are familiar with, and also for viewing online merchandise, so you have a very good idea of exactly what colors you are buying and are less likely to return them. The Surface 3 has one of the most color accurate screens of any tablet or Smartphone display that we have ever measured for the sRGB/Rec.709 Standard that is used in virtually all current consumer content for digital cameras, HDTVs, the internet, and computers, including photos, videos, and movies. Its Color Gamut is 109 percent in 0 lux absolute darkness, slightly larger than the Standard Gamut as shown in this Figure. The Absolute Color Accuracy for the Surface 3 is an Excellent 2.2 JNCD, among the most color accurate displays that we have ever measured for a tablet or smartphone. See this Figure for an explanation and visual definition of JNCD and the Color Accuracy Figures showing the measured Color Errors. See the Color Accuracy section, the Color Gamut Figure, and the Color Accuracy Figures for measurements and details. Displays are almost always calibrated and tested in the dark (0 lux) in order to prevent ambient light from contaminating the measurements, but they are almost always used in real world ambient lighting conditions at higher lux levels. Tablets are most often used indoors, but also outdoors under protected or subdued lighting. Typical indoor ambient lighting levels for comfortable workspaces are generally somewhere in the neighborhood of 300 lux, although in some office and commercial settings it may be higher and closer to 500 lux. Ambient light levels can of course be considerably higher, but most users will then try to reorient or reposition themselves and/or the display in order to reduce the amount of light hitting the screen. Any ambient light reflected off the screen will wash out the images seen on the display, resulting in reduced image contrast, color saturation, and color accuracy. So, in principle, the display should have an appropriately higher color saturation and larger Color Gamut in order to counterbalance and compensate for the loss of color saturation in ambient light. And that is exactly what happens on the Surface 3. Its native Color Gamut triangle is appropriately enlarged so that the on-screen Color Gamut at 300 lux results in an almost perfect sRGB/Rec.709 Standard Color Gamut, which is shown in Figure 1. We remeasured the Absolute Color Accuracy in 300 lux ambient light, which is shown in Figure 2c. It is a very impressive 1.7 JNCD, more accurate than at 0 lux, and more accurate than any other display that we have ever measured in real world ambient lighting conditions at 300 lux. See this Figure for an explanation and visual definition of JNCD and the Color Accuracy Figures showing the measured Color Errors. See the Color Accuracysection, the Color Gamut and the Color Accuracy Figures for measurements and details. The Intensity Scale (sometimes called the Gray Scale) not only controls the contrast within all displayed images but it also controls how the Red, Green and Blue primary colors mix to produce all of the on-screen colors. So if the Intensity Scale doesn’t follow the Standard that is used to produce virtually all consumer content then the colors and intensities will be wrong everywhere in all images. Unfortunately, many manufacturers are quite sloppy with the Intensity Scale on their displays because it must be logarithmic. Fortunately, the Intensity Scale on Surface 3 is very accurate and a close match to the sRGB/Rec.709 Standard, although it becomes less steep with lower image contrast at the very dark end for signal levels below 25 percent. See Figure 3for a plot of the measured Intensity Scale and the Colors and Intensities section for measurements and details. Mobile displays are often used under relatively bright ambient light, which washes out the image colors and contrast, reducing picture quality and making it harder to view or read the screen. The Surface 3 has a Peak Brightness of 395 cd/m2 (nits), which is Very Good, slightly lower than other full size tablets like the Apple iPad Air 2 with 415 nits, but much less than some medium size tablets like the Kindle Fire HDX 8.9 with 527 nits. High screen Brightness is only needed when working in High Ambient Light, but since the Surface 3 is larger it is less likely to be used outdoors in unshielded high ambient light environments like Smartphones and smaller tablets, so its somewhat lower (but still Very Good) Peak Brightness should not be an issue for most users and applications. See the Brightness and Contrast section for measurements and details. Displays are seldom used in absolute darkness, so their screen Reflectance and performance in Ambient Lighting is very important. The Surface 3 adjustable kickstand is particularly useful for adjusting the display angle in order to minimize reflections. The screen Reflectance for the Surface 3 is 6.0 percent, which is Very Good and in the middle of most of the better tablets, which fall in the range of 5.0 to 6.5 percent. However, the current record holders for low Reflectance are the iPad Air 2 and iPad mini 4, which have 2.5 and 2.0 percent screen Reflectance by using an anti-reflection coating on the screen. The display’s Contrast Rating for High Ambient Light measures the screen’s readability in Ambient Light and depends on both the screen Reflectance and Maximum Brightness. For the Surface 3 it is 65, which is again Very Good. It is again in the middle of most of the better tablets, but significantly lower than a few tablets that have values over 100. See the Screen Reflections and Brightness and Contrast sections for measurements and details. While tablets are primarily single viewer devices, the variation in display performance with Viewing Angle is still very important because single viewers frequently hold the display at a variety of viewing angles, plus they are large enough for sharing the screen with others. One important advantage of the Surface 3 is its adjustable kickstand, which makes it possible to adjust the Viewing Angle of the display in the same way as a Laptop. That is not only convenient but also reduces any Viewing Angle effects. The Surface 3 has a high performance IPS / PLS LCD display, so we expected it to show very small color shifts with Viewing Angle, and our lab measurements confirmed its excellent Viewing Angle performance, with no visually noticeable color shifts. However, all LCDs, do have a strong decrease in Brightness (Luminance) with Viewing Angle, and the Surface 3 showed (as expected) a 54 percent decrease in Brightness at a modest 30 degree viewing angle. See the Viewing Angles section for measurements and details. With its relatively accurate Intensity Scale and very accurate colors the Surface 3 provides very nice, pleasing and accurate colors, and picture quality. The very challenging set of DisplayMate Test and Calibration Photos that we use to evaluate picture quality looked Beautiful, even to my experienced hyper-critical eyes. However, viewers that like vivid or exaggerated colors and image contrast may find the color accurate Surface 3 images to appear somewhat subdued. While the Surface 3 display is larger in area than most other top tier tablets and would normally be expected to require more power, its display is more power efficient and it actually uses less power than many smaller tablets. For example, for an equivalent area and display brightness the Apple iPad Air 2 display uses 76 percent more display power than the Surface 3. This is due in part to its lower pixels per inch, which affects the display’s power efficiency, but it is also the result of higher efficiency White LEDs and optical stack in the Surface 3 display. See the Display Power section for measurements and details. The primary goal of this Display Technology Shoot-Out article series has always been to publicize and promote display excellence so that consumers, journalists and even manufacturers are aware of and appreciate the very best in displays and display technology. We point out which manufactures and display technologies are leading and advancing the state-of-the-art for displays by performing comprehensive and objective scientific Lab tests and measurements together with in-depth analysis. We point out who is leading, who is behind, who is improving, and sometimes (unfortunately) who is back pedaling… all based solely on the extensive objective careful Lab measurements that we also publish, so that everyone can judge the data for themselves as well. The Conclusions below summarize all the major results. See the main Display Shoot-Out Comparison Table for all the DisplayMate Lab measurements and test details, and see the Results Highlights section above for a more detailed introduction and overview with expanded discussions and explanations. Based on our extensive Lab tests and measurements on the display for the Surface 3, Microsoft has produced an excellent high performance display for Windows. In fact, the Surface 3 has one of the very best and most accurate displays available on any mobile platform and OS. It joins near the top of a small set of tablets that have excellent top tier displays — ideal for both professionals that need a very accurate high performance display for their work, and for consumers that want and appreciate a really nice and beautiful display. The Surface 3 delivers uniformly consistent all around Top Tier display performance: it is only one of a few displays to ever to get all Green (Very Good to Excellent) Ratings in all test and measurement categories (except for Brightness variation with Viewing Angle, which is the case for all LCDs) since we started the Display Technology Shoot-Out article Series in 2006, an impressive achievement for a display. See the Shoot-Out Comparison Table for the detailed test and measurement results. Comparisons with the other leading tablets are examined below. The Surface 3 has one of the most color accurate tablet displays that we have ever measured for all standard consumer content (sRGB/Rec.709). It is tied for first place with the Surface Pro 3 and the Samsung Galaxy Tab S 10.5. That is an impressive achievement because everything in the display has to perform just right in order to produce very accurate colors – it is the single most challenging and important performance characteristic for a display. The Absolute Color Accuracy for the Surface 3 is an Excellent 2.2 JNCD. Displays are almost always calibrated and tested in the dark (0 lux) in order to prevent ambient light from contaminating the measurements, and the above test results are for 0 lux. However, displays are almost always used in real world ambient lighting conditions at higher lux levels. Typical indoor ambient lighting levels for comfortable workspaces are generally somewhere in the neighborhood of 300 lux, although in some office and commercial settings it may be somewhat higher. Any ambient light reflected off the screen will wash out the images seen on the display, resulting in reduced image contrast, color saturation, and color accuracy. As a result, the display should have an appropriately higher color saturation and Color Gamut in order to counterbalance and compensate for the loss of color saturation in ambient light. And that is exactly what happens on the Surface 3. The Absolute Color Accuracy for the Surface 3 in 300 lux ambient lighting is a very impressive 1.7 JNCD, better than for 0 lux, and better than any other display we have ever measured in real world ambient lighting of 300 lux. See the Color Accuracy Highlights and Color Accuracy sections, and the Color Gamut and Color Accuracy figures for measurements and details. The Surface 3 is the first display that has a larger Color Gamut optimized for typical 300 lux indoor ambient light levels instead of for viewing in total darkness. It is the first step in getting future displays to fully adjust their calibration based on the current level of ambient light that it is being exposed to. Right now most mobile displays and some TVs only raise or lower the display’s Luminance based on the level of ambient light. The next steps include also adjusting the Color Gamut and the Intensity Scale. The most important improvements for both LCD and OLED mobile displays will come from improving their image and picture quality and screen readability in real world ambient light, which washes out the screen images, resulting in reduced image contrast, color saturation, and color accuracy. The key will be in lowering screen Reflectance and implementing Dynamic Color Management with automatic real-time modification of the display’s native Color Gamut and Intensity Scales based the measured Ambient Light level in order to have them compensate for the reflected light glare and image wash out from ambient light as discussed in our 2014 Innovative Displays and Display Technology and SID Display Technology Shoot-Out articles. The displays, technologies, and manufacturers that succeed in implementing this new real world high ambient light performance strategy will take the lead in the next generations of mobile displays. Below we examine in-depth the display on the Microsoft Surface 3 based on objective Lab measurement data and criteria. Click this link to see the complete Data Comparison Table. Dr. Raymond Soneira is President of DisplayMate Technologies Corporation of Amherst, New Hampshire, which produces display calibration, evaluation, and diagnostic products for consumers, technicians, and manufacturers. See www.displaymate.com. He is a research scientist with a career that spans physics, computer science, and television system design. Dr. Soneira obtained his Ph.D. in Theoretical Physics from Princeton University, spent 5 years as a Long-Term Member of the world famous Institute for Advanced Study in Princeton, another 5 years as a Principal Investigator in the Computer Systems Research Laboratory at AT&T Bell Laboratories, and has also designed, tested, and installed color television broadcast equipment for the CBS Television Network Engineering and Development Department. He has authored over 35 research articles in scientific journals in physics and computer science, including Scientific American. If you have any comments or questions about the article, you can contact him at dtso.info@displaymate.com. DisplayMate Technologies specializes in proprietary advanced scientific display calibration and mathematical display optimization to deliver unsurpassed objective performance, picture quality and accuracy for all types of displays including video and computer monitors, projectors, TVs, mobile displays such as smartphones, smart watches, and tablets, and all display technologies including LCD, OLED, 3D, LED, LCoS, Plasma, DLP and CRT. This article is a lite version of our intensive scientific analysis of displays – before the benefits of our advanced mathematical DisplayMate Display Optimization Technology, which can correct or improve many of the display deficiencies. We offer DisplayMate display calibration software for consumers and advanced DisplayMate display diagnostic and calibration software for technicians and test labs. For manufacturers we offer Consulting Services that include advanced Lab testing and evaluations, confidential Shoot-Outs with competing products, calibration and optimization for displays, cameras and their User Interface, plus on-site and factory visits. We help manufacturers with expert display procurement, prototype development, and production quality control so they don’t make mistakes similar to those that are exposed in our Display Technology Shoot-Out series. See our world renown Display Technology Shoot-Out public article series for an introduction and preview. DisplayMate’s advanced scientific optimizations can make lower cost panels look as good or better than more expensive higher performance displays. If you are a display or product manufacturer and want to turn your display into a spectacular one to surpass your competition then Contact DisplayMate Technologies to learn more. For comparisons and additional background information see our Surface Pro 3 Display Technology Shoot-Out, our iPad Air 2 Display Technology Shoot-Out and our OLED Tablet Display Technology Shoot-Out articles.